CNS Neurosurgery takes pride in the scope, quality and accessibility of the neurosurgical services we provide to patients across Australia. Offers in-person neurosurgery consultations and SECOND OPINIONS at our various professional Rooms locations throughout south-eastern Australia. 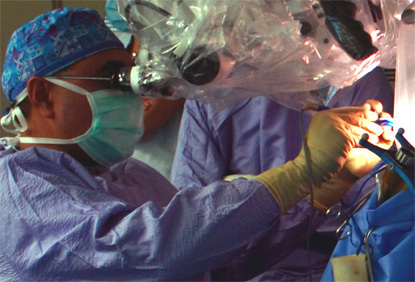 Carries out BRAIN & SPINE SURGERIES including SALVAGE surgery (minimally invasive techniques and technologies, aided by technologies such as ROBOTIC-assistance, neuronavigation, real-time neurophysiological monitoring, awake craniotomy options). Is a specialist TELE-HEALTH provider certified by the Royal Australasian College of Surgeons, and offers Skype-based tele-medicine / tele-health consultations to patients located throughout Australia. Also consults privately as an independent MEDICOLEGAL EXPERT (Canberra, Melbourne & Sydney) and for MLCOA (Canberra), often in complex matters involving major insurance companies, leading law firms, and Federal Government agencies, with experience in over 800 medicolegal assessments and professional reports since 2009. Dr Khurana is a sought-after medical expert in Court, Inquest and Tribunal matters. Provides free and ready access to high quality, comprehensive and reader-friendly neurosurgery educational information via links on our RESOURCES page. Can facilitate direct access to high-level MULTI-DISCIPLINARY CARE through his colleagues in VIC and NSW/ACT (neurology, oncology, ophthalmology, ENT, interventional radiology, peri-operative care, pain management, endocrinology, anesthesia).